Storing bitmaps in quadtrees at Play With Lua! This is an adaptation of a chapter from The New Turing Omnibus , a great little tour of a few dozen areas of CS. This is about a way to compress a bitmap, to store it without storing each individual pixel. The technique is called a quadtree. We’re going to split a bitmap up into four equally-sized chunks, then compress and store those. The savings comes from the fact that we aren’t going to store equivalent chunks twice. And we’ll want to know if two nodes in our quadtree are equal. So let’s decide what that actually means. And so on. Eventually, of course, we hit a 1×1 area, which there are only two possible values for, so we’ll just store a true or false there. 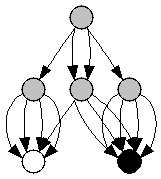 A “flyweight” is any node that appears in multiple places in a tree, reused to save space. We start out by creating a flyweight table containing the two basic nodes, then we look at the current node: if it’s a tree, we recurse on all its children to turn them into node indices. Then, we just need to find where the current node is in the flyweight table, and return that index (and the updated flyweight table). It’s very straightforward, if a little ugly to be passing around and modifying the table. This one is exactly as many bits as the uncompressed form, but if we increased it to 16×16 it wouldn’t be. Images with big blocks of whitespace compress very well this way too. We can easily rotate the image by just re-ordering the children on each node in the list. Much cheaper to rotate it this way than by copying it, and we can even do it in-place. Plus, it becomes very easy to load a single rectangular region of a map: trace down the tree until you get to the chunk you want and then only render that piece. It could be very useful if you’re making a game around very large generated maps. Anyway, the code is here, play around with it! Even if it’s not so useful as a way to compress things (run-length encoding is more efficient) it’s still a cool way to store things.